Why Should You Buy a Pair of Bluetooth Headphones? How to Clean and Maintain Your Headphones? If you’re looking for a new pair of affordable headphones that support Bluetooth technology, we have prepared this list of 10 best Bluetooth headphones under $100 to show you that it is really not so difficult to fulfill all the criteria. All the products on our list support newer Bluetooth versions with good signal range, they are comfortable and they don’t cost much. Actually, if you stay with us, you will be surprised how much some of the models offer in comparison to their price. The list gathers 10 different models of Bluetooth headphones. Some of them are full-size headphones while the others belong to the earbud category. All of them can be used for most of our daily activities while some can even be used for sports activities. We suggest you stay with us and find out more not only about these specific models but also about the headphones in general. Bluetooth headphones don’t have wires and this is one of the most important characteristics that make them more popular than wired models. They connect to your phone, player, notebook or TV wirelessly and give more freedom to your movements. Everything seems easier with wireless devices. When you’re outside your house, you can put your phone or player in your pocket and there won’t be cables that dangle around and catch on your clothes or the things you’re holding, ripping the headphones from your ears. Bluetooth headphones are stylish and trendy and this makes them extremely desirable. They are now available in all shapes and forms just like the wired models but you have to admit that headphones look more stylish without cables. Bluetooth headphones can be affordable and our list of 10 best Bluetooth headphones under $100 proves it in the best possible way. People usually think that Bluetooth headphones are expensive but you can get quite a deal for $100 or less. Bluetooth headphones are easy to use and widely compatible. They are not made to be used only with phones or players. Newer models are manufactured to be compatible with newer models of TVs and notebooks. Bluetooth headphones are easy to use and have many interesting features. Most of Bluetooth headphones have at least the main control buttons on one of the cups. Bluetooth earbuds, on the other hand, have control pads on their audio cables where all the control buttons are located. They also have built-in/inline mics that allow you to take your calls without using your phone. The leading position on our list of 10 best Bluetooth headphones have taken the Mpow 059 full-size headphones. If you take their price and countless features into account, you will see that it’s no wonder they are one of the Amazon’s best sellers. They come in seven colors (red, black, pink, silver, gray, blue and green), they support 4.0 Bluetooth version with 33ft signal range and the battery that can offer up to 20 hours of playback/talk time (13-15 hours on average). The headphones have 40mm drivers, their frequency range spans from 8 Hz to 24 kHz, their impedance is 30 Ohms and sensitivity 122 dB. Mpow 059 weigh 9 ounces. On the left side, you will find the aux port while the control buttons (play/pause button, volume controls and the buttons for skipping tracks) and micro USB charging port are on the right ear cup. In the box, you will find the USB to micro USB charging cable, 4ft 3.5mm male-to-male audio cable, user manual and a protective bag. 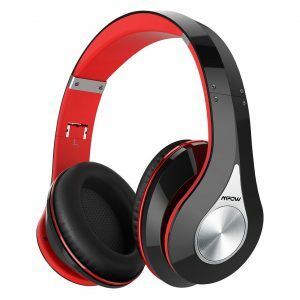 Mpow 059 are good-looking affordable headphones that come in many interesting and attractive colors. They can be used as both wired and wireless, which means you will be able to listen to music even if you run out of their powerful battery. You can answer calls hands-free and the control buttons are big and easy to use while the Bluetooth connection works like a charm. When it comes to comfort, these are relatively light headphones with nicely padded cups and adjustable headband. They are also foldable and highly portable. The sound quality is quite good considering the price. The mids, the highs, and the lows are distinctive, the bass is quite deep and powerful, while the mids are quite balanced. They also support CVC 6.0 noise reduction technology that can help in moderately loud areas. Mpow 059 could sound better but that would definitely cost more. The bass can sometimes be a bit boomy and the mids can be muddy. The mic can’t be used in wired mode and the CVC technology is not very helpful in a very loud environment. You can’t pair them with TVs without a separate Bluetooth adapter and recharging takes 4 hours or more. The cups aren’t very spacious and people with bigger ears could think they are on-ear headphones. Finally, we don’t like the glossy finish because it attracts fingerprints. 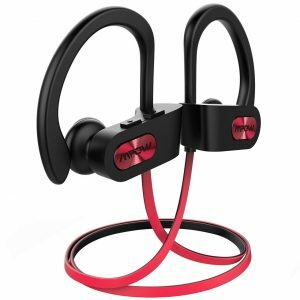 Mpow Flame are inexpensive and extremely popular Bluetooth earbuds that come in many different colors (red, black, flash blue, pink, tiffany blue, and green). They weigh 2.8 ounces, they support 4.1 Bluetooth version with 33ft signal range and their battery can last up to 7 hours after 1.5 hours of charging. These headphones support CVC 6.0 noise reduction technology and they are completely waterproof thanks to the IPX7 rating. On the right earbud, you will find all the control buttons (the multifunctional button also used for turning the buds on/off, pairing them with the source device, playing/pausing music and answering calls and the volume controls), built-in mic and Bluetooth LED light. USB charging port is on the bottom of the same earbud. The headphones come in a simple packaging with the user manual, USB charging cable, 3 pairs of silicone and one pair of foam ear tips, cable clip and a carrying case. Mpow Flame have simple but ergonomic design thanks to the angled tips that allow the buds to go deep in your ear canal and isolate as much noise as possible. They also have the soft flexible ear hooks that go around your ears keeping the buds in your ears even during workouts. The headphones have the nice matte finish, flat tangle-free audio cable, and highly accessible controls. The tips come in several sizes and the foam ones are specially made for people with very small ears. These earbuds have surprisingly good built quality for the price. They have the IPX7 rating, which makes them waterproof, sweat proof and more resistant to damages than regular earbuds without this type of protection. The sound that these earbuds deliver is extremely good. If we didn’t know their price, we would think they are much more expensive. They are loud and the sound is clear and balanced. The vocals sound amazingly clear while the lows and the highs are more than good. The built-in mic works nicely. Considering that these earbuds are presented as “bass earbuds”, we have to complain. We don’t say the bass is bad or weak but these are definitely not “bass earbuds”. These earbuds aren’t compatible with TVs, especially for watching movies. Some customers complained about flimsy flap on the USB port while some others reported that they have been unable to find the right tip size. Cowin E7 are reasonably priced headphones that enable you to use many useful features for a decent amount of money. They come in black, blue and purple colors but you have to bear in mind that the last two versions cost a few dollars more than the black version. E7 support 4.0 Bluetooth version with 33ft signal range and the battery that offers 24-30 hours of playback or talk time and they support quick charging (10 minutes of charging enables you to use the headphones for a full hour). They support ANC technology, they can be also used in wired mode and ANC is available in both modes. They have 40mm drivers, their frequency range spans from 20 Hz to 20 kHz, their sensitivity is 75 dB and impedance 32 Ohms. NFC is also supported. On the right ear cup, you will find the 3.5mm aux port, control buttons (power on/off button that is used for answering calls, the buttons for controlling the volume/skipping tracks, pairing and the ANC button) and the built-in mic. The packaging is much more expensive than you would expect and inside the box, you will find the headphones, user manual, warranty card, USB charging cable, 4ft audio cable and a protective case. Cowin E7 are elegant headphones and we really like their design. They are Bluetooth headphones with great battery life that can be used as wired too, which makes them great for long trips where it is kind of possible to run out of battery. They support not only ANC that saves you from the great part of the ambient noise and saves your hearing because you don’t have to turn up the volume too much, but also the NFC technology that enables you to use the touch-and-pair feature. As far as comfort and ease of use are concerned, these headphones are very good. The cups and the headband are nicely padded and the cups are spacious and flexible, so they can easily be adjusted to your head and ears. E7 deliver balanced and pleasant sound. The lows, the mids, and the highs are distinctive and the bass is quite present. First, we would like E7 to have the matte finish. It would be cleaner and more practical. Second, these headphones are a bit bulky and heavy, considering they weigh whole 13 ounces. In addition, some customers were complaining about the headphone durability in spite of the metal reinforcements on the hinges. Last, some people reported that turning ANC on affects the sound quality and make the music sound a bit dry. Also, E7 are proven to leak a lot of sound and they don’t have the aptX codec. 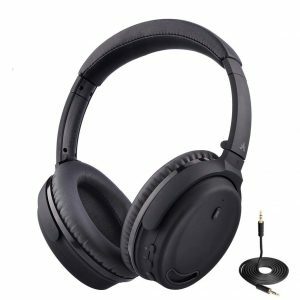 Avantree ANC032 are reasonably priced headphones that support 4.1 Bluetooth version as well as ANC technology that manages to reduce up to 18 dB of ambient noise. The headphones have 40mm drivers, they weigh 6.4 ounces and they are available in black color only. Their frequency response spans from 20 Hz to 200 Hz, their impedance is 32 Ohms, and their battery offers up to 10 -18 hours of playback/talk time. The headphones support aptX low latency codec, Headset, Handsfree, AVRCP, and A2DP profiles. On the right ear cup, you will find the ANC button, volume controls, built-in mic, power on/off button (also used for Bluetooth pairing) as well as the charging and aux ports. ANC032 come in a nice packaging with 3.5mm aux cable, carrying case, USB charging cable, 2-year warranty, and user manual. One of the first things you notice about these headphones is their nice matte finish that looks rather attractive and simple, at least to us. The headband is extendable and adjustable but also nicely padded. 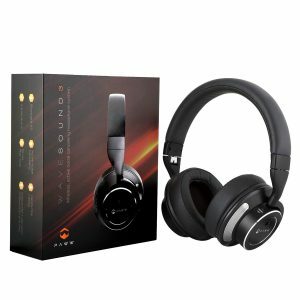 The cups can swivel, they are spacious and decently cushioned, while the headphones are completely foldable and highly portable, especially because of the provided carrying case. They can be used in Bluetooth mode for many daily activities thanks to the durable battery that can last up to 10 hours even with BT and ANC turned on at the same time. However, if you run out of juice, you can simply plug in the audio cable and keep listening. The build quality is decent for inexpensive ANC headphones and the Bluetooth connection works well. ANC feature can be turned on or off depending on the situation and your preferences. With these headphones, you can receive phone calls hands-free and even watch movies on TV thanks to the low latency codec. The sound quality is satisfying, even with the ANC on. The bass is present and pleasant, just like the mids and the highs, which are also distinctive and decently clear. The headphones also offer good passive noise isolation and they sound good regardless of the type of music played. Taking into consideration the features and the price, we must notice that the sound quality could have been better and the ANC could block more noise. Also, the headphones are completely plastic and they do not look extremely durable so we advise you to keep them in their case whenever you’re not using them. Paww Wave Sound 3 are the most expensive product on the list of 10 best Bluetooth headphones under $100. However, their design and numerous features completely justify their price. The headphones come in white, black and blue colors, they support 4.0 Bluetooth version with 30ft signal range and their battery can last up to 16 hours after being charged for 3-4 hours. They have 40mm drivers and they support ANC technology. Wave Sound 3 weigh 12.8 ounces. The headphones have all their controls divided into two groups. The power on/off button (also pairing button), separate volume and track control buttons are on the right ear cup, while the ANC on/off button is on the left cup. 3.5mm port and the Bluetooth indicator light are on the right side, while the ANC indicator light and the USB charging port are on the left. In the box, you will find the headphones, protective case, 3.5mm aux cable, USB charging cable, airplane adapter, user manual, and 1-year warranty card. These headphones have very attractive design with the shiny matte finish. They have the nicely padded adjustable headband and well-cushioned cups that lay nicely on customer’s head and don’t put too much pressure on ears. 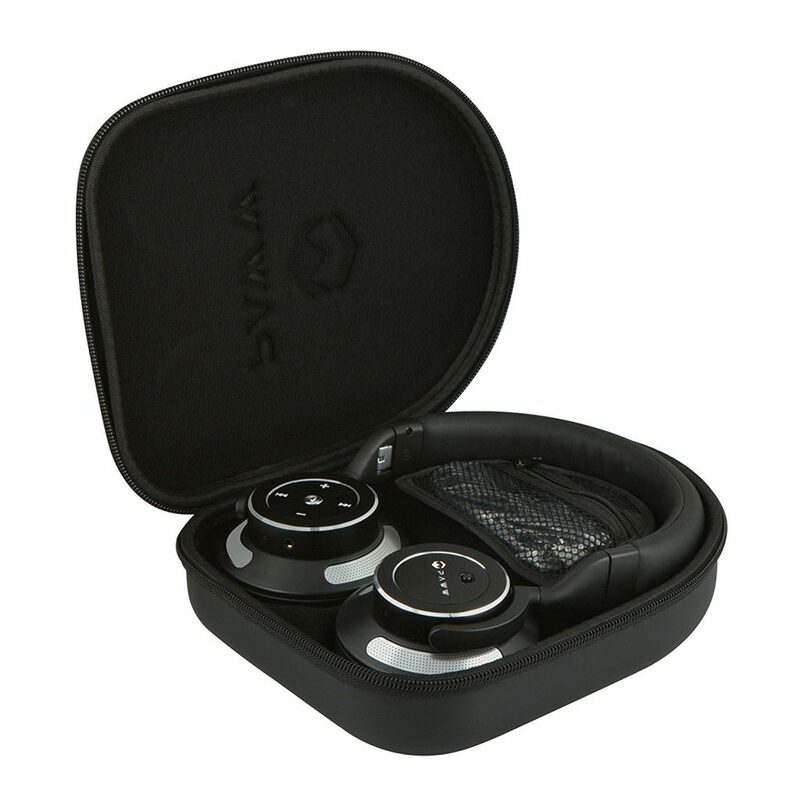 Wave Sound 3 are partially made from metal, which increases their price but also makes the headphones more durable. However, this amount of metal doesn’t affect the comfort they offer to their buyer. They are very comfortable, they don’t cause overheating and ear sweating and they are foldable and highly portable as they come with the carrying case. The Bluetooth works nicely, the pairing process is fast and easy, and ANC manages to isolate up to 20 dB of ambient noise. It can also be turned on or off depending on the situation. When it comes to sound quality, we are more than satisfied with Paww WS 3. They deliver balanced sound with distinctive mids, highs, and lows. With ANC turned off, the bass is not so noticeable so if you love bass, you will definitely keep ANC turned on all the time. Some customers have complained about headphones being too bulky, the cups being too big and the build quality being very bad (they mentioned some kind of rattling during wearing headphones). As they weigh almost 13 ounces, Wave Sound 3 are among heavier headphones on the market and some people find them too heavy. We really don’t have major complaints in sound quality area but we have to warn you that ANC doesn’t block all the sounds, especially not the high tones like screaming. 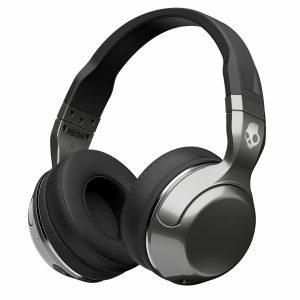 As all Skullcandy headphones, Hesh 2 are very popular and they are not even expensive. 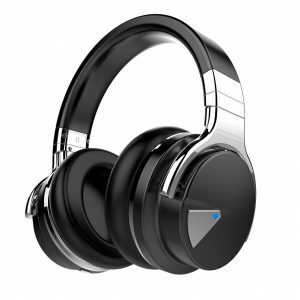 These headphones come in black, blue and silver colors, they can be used as both wireless and wired and their battery lasts up to 15 hours while recharging takes 2.5 hours. They weigh approximately 8 ounces, their frequency response spans from 18 Hz to 20 kHz while their impedance is 35 Ohms and their sensitivity 105 dB. On the left ear cup, you will find 3.5mm aux and USB charging ports while the multifunctional button, volume controls, and the built-in mic are on the right side. Hesh 2 come in a nice packaging with 4ft detachable 3.5mm audio cable, USB charging cable and a carrying pouch. Skullcandy Hesh 2 are nicely designed headphones available in popular colors with the nice matte finish that doesn’t attract fingerprints. All the controls are highly accessible, the headphones are easy to use and pair, and there were no complaints regarding connection quality. The headphones have good battery life but they can also be used in wired mode, so if it happens that you run out of battery, you can always connect the cable and keep listening to your favorite music, podcasts, etc. The headphones are made from plastic but there were no major complaints in this area. They have proven to be quite reliable and durable. The headband is adjustable and extendable, and the cups have soft and thick cushions. They can also swivel, which makes them easily adjustable to customer’s ears. The cushions are made from soft foam and covered with synthetic leather. As far as sound quality is concerned, we are more than satisfied. The lows, the mids, and the highs are distinctive and pleasant and the headphones can get very loud. These headphones sound good no matter what kind of music you love to listen but they can also be used for answering calls hands-free. The cushions on the cups are very thick, which enables them to isolate a great deal of ambient noise. Hesh 2 have specific ear cup shape and size. We can’t say they are true full-size cups. They are in fact somewhere in between on-ear and over-ear cups. No matter how soft they are, if your ears are too big and can’t fit, the headphones will be uncomfortable. Customers have also complained about the sound leakage, which is significant in this case. Phaiser BHS-730 are affordable Bluetooth earbuds that come in black, blue, red, green and purple colors, with 4.1 Bluetooth version, 30-40 feet range and the battery that can offer up to 8 hours of use. Recharging takes between 1 and 2 hours. The headphones weigh 0.6 ounces, they are sweat proof and they have 8mm drivers. The earbuds (earpieces) are a bit angled, which makes them ergonomic, they have ear wings and their control buttons and the inline mic are placed on the control pad on the left side of the audio cable. The earbuds come with USB charging cable, 3 pairs of silicone ear tips and ear wings, 1 pair of foam ear tips, 2 cable and 2 cloth clips as well as the hard-shell carrying case. BHS-730 are good-looking earbuds available in several different colors. They are meant to be used for sports and their design reflects that. They have silicone ear wings and very comfortable ear tips that enter deep in the ear canal in order to ensure secure fit. The audio cable is flat and tangle-free so you won’t have problems in this area. The earbuds have good built quality mostly thanks to their metal housings. Anyway, the customers did not have any major complaints in this area. BHS-730 are also quite comfortable and easy to use. They don’t slip out from ears so easily, they have the inline mic and highly accessible controls, so you can control your listening without taking out your phone. The earbuds come with several clips that you can use to manage cable length or attach the cable to your clothes to prevent it from bouncing and dangling. When it comes to sound quality, BHS-730 deliver pleasant sound with powerful bass and clear highs. Even the vocals are very clear and pleasant for listening. The earbuds support CVC 6.0 noise reduction technology that works very well. One of the few complaints about Phaiser BHS-730 is about the poor control pad built quality. According to some customers, it easily falls apart and the nano protective layer starts to peel off. We would also like the earbuds to have longer battery life because 8 hours at the moderate volume is way behind the competition. 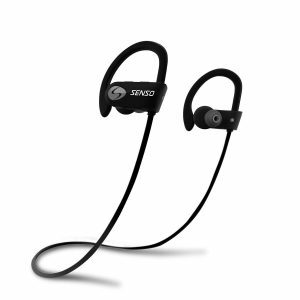 Senso Active Buds S-250 are one of the cheaper headphones on the market that support 4.1 Bluetooth version with 30ft signal range. Their battery lasts up to 8 hours battery while recharging takes 1.5 hours. The earbuds come in black and black/red colors, they weigh 0.2 ounces and they have the IPX7 rating. The earbuds have big housings with silicone ear hooks. On the right earbud, you will find the control buttons (multifunction button on the front side and the volume controls on the top), USB charging port and the built-in mic. The earbuds come in a simple box with 3 pairs of silicone ear tips in 3 different sizes, car charger, one sturdy carrying case, cable clip and two USB charging cables. ActiveBuds are very popular and good-looking earbuds made for everyday use and all kinds of sports activities. They are very light and easy to use while the Bluetooth pairing and connection work great. The headphones are also very comfortable, they come with a whole set of ear tips so that the customers could find the matching size for themselves. The earbuds stay in place no matter what you do, the ear hooks are there to provide extra support and the cable is flat and tangle free. In case you find it too long or too disturbing while working out, you can always attach it to the clothes or shorten it with the clip. The earbuds are made from plastic but they are quite comfortable, actually. They are also completely sweat proof and waterproof, so you can normally use them in the gym and even when it is raining. S-250 deliver a surprisingly pleasant sound for the price. The highs are very clear and the bass is very deep. The earbuds support CVC 6.0 noise reduction technology so you can count on good noise isolation in a moderately noisy environment. One of the rare complaints about S-250 is related to the mids that really don’t sound as clear as we would like them to be and vocals are very important when it comes to sound quality. We wouldn’t recommend these for running on windy days because you will hear some kind of rattling that can be quite annoying. After numerous charges, it may become quite difficult to close the USB charging port because the flat may wear out and get loose. SoundPeats SP-Q30 are the relatively cheap earbuds that come in black, blue, pink, white and red colors. They have 10mm drivers, they weigh 0.53 ounces, they support 4.1 Bluetooth version with CSR8645 chip and their battery can last up to 8 hours. The earbuds have the IPX6 rating. Recharging takes 2 hours. The control pad is on the right side of the rounded audio cable and you will find there the play/pause button, Bluetooth indicator light, volume controls, built-in mic, and the USB charging port. The earbuds come in a small simple cardboard box with carrying pouch, user manual, 10 different spare regular tips and tips with ear wings, cable clip and charging cable. Q30 look rather attractive and they seem well built, especially because of the magnetic housings that feel rather durable. There is also the IPX6 rating that enables you to work out without worrying about sweat or rain that might damage your earbuds. These earbuds have angled ergonomic design, they go deep in your ear canal and pop out only occasionally. There are also the ear wings in different sizes that you can use to provide more stability during workouts. The earbuds are easy to use, the controls are highly accessible and they can be paired with two devices simultaneously. You can control your music hands-free and even answer important calls no matter where you are. In case you find the audio cable too long or bouncing annoyingly on your neck, you can use the clip to shorten it or attach it to your clothes. When you don’t use them, you don’t even have to put them in your bag if you’re going to use them soon after that. They have magnetic housings so you can simply wear them around your neck. The earbuds have pleasant and balanced sound. The bass is present but not too exposed, the mids are usually quite clear and crisp while we also can’t complain about the highs that don’t lack clarity. These earbuds sound quite good with rock music. Truth to be told, the battery could have been better because you will get 8 hours only if you listen to music at moderate volumes. When you turn the volume up, you lose a lot of time. Q30 don’t offer amazing sound quality and they are definitely made for bass heads because the bass is often muddy and it can overwhelm the mids. Be careful when charging these. Some customers experienced control pad melting down so we strongly recommend sticking up to the given instructions when charging is concerned. 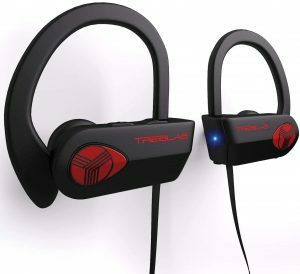 Treblab XR500 are relatively cheap sports earbuds that support 4.1 Bluetooth version with 38ft signal range and the battery that can last up to 9 hours (recharging takes up to 2 hours). The earbuds weigh 0.2 ounces, they come in black, black/silver, pink, purple and white colors and they are completely waterproof and sweat proof (IPX7 rating). The earbuds have slightly angled design and they have big housings with silicone ear hooks. On the right side, you will find the multifunctional button and the volume controls. There are also the built-in mic and the USB charging cable. The earbuds come in a simple box with 6 pairs of foam and silicone ear tips in different sizes, one cable clip, one sturdy carrying case, and USB charging cable. XR500 are great Bluetooth earbuds that you can get for a decent amount of money. They are quite light so you won’t even feel them on your head. They are very comfortable and they go deep in the ear canal, which means they manage to isolate you from one part of the ambient noise. The tips are available in different sizes and in different materials. The hooks are soft and made from silicone. Their main task is to ensure that the earbuds don’t fall from your ears during different activities. The cable is flat and it doesn’t tangle. In case you find it too long or that it bothers you during workouts, you can adjust its length using the provided clip. 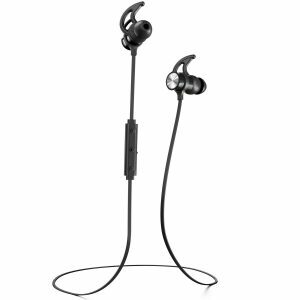 The earbuds are plastic but quite durable, especially thanks to the IPX7 rating that makes them water resistant and allows you to even submerge them into the water for up to 30 minutes. When it comes to sound quality, we must say we are satisfied. These earbuds sound more than fine for the pair of earbuds in this price range. The sound they deliver is quite clear, balanced and pleasant, while the bass is nicely emphasized. Some customers have complained about signal cutouts during walking, running, etc. It seems that this can happen even if your phone is very close to your headphones – in your pocket. Also, there were some complaints regarding the multifunction button. When the earbuds slip out due to excessive sweating, for example, and you try to push them back in your ear, it can happen that you press the button and pause the music. Well, this is something people don’t often talk about but maintenance is one of the things that affect the life length of any product we buy. Just like we take care of our clothes and wash them after wearing it, we have to take care of our tech equipment. This is what can prolong their life and make them perform well even after years and years of using. Headphones can get dirty and we all know it, especially when it comes to earbuds. They are in contact with ear wax, makeup, facial and hair products all the time. They also pick dirt and dust in our bags, pockets or when we are using them outdoors. Cleaning your headphones at least once a week and storing them properly after every use can help a lot and we will explain to you how you can do it. For making your headphones clean you won’t need more than warm water, soap and a piece of cloth. After taking off your headphones, turn them off and disconnect them from the source device. You can clean them with water and soap and dry completely with the cloth. We recommend water over alcohol because alcohol can damage plastic or leather parts and take off the paint. Warm water shall destroy all the dirt and germs. The only thing you have to make sure is that the dirt doesn’t reach the drivers as it can significantly lower the performance level. If you have full-size headphones with removable cushions, it is recommendable to take them off just like you should take off tips from earbuds and clean them separately. When it comes to storing the headphones after every use, we have a few important suggestions that are crucial if you want the headphones to last. First, you should store the headphones in their bag or case after every use. In case the bag/case doesn’t come with the headphones, you should buy one separately. This way, your headphones will be protected from breaking down or, at least free from scratches. Second, in case your headphones get in contact with water, sweat or rain, make sure you have dried them carefully before you put them in their bag/case. If you can’t wait for them to dry completely, shake them before use and make sure you have shaken off most of the moisture. In addition, don’t leave the ports open as dirt and dust can go inside even in the protective bag. The dust will pile up over time and make the charging quite difficult or make it completely impossible. Last, in case your headphones come with a cable which makes them usable as both wired and wireless, try to store the cable carefully in order to save it from damaging. Don’t wrap it around the source device and try to unplug it while holding the plug, not the cable. Every one of us is buying the pair of headphones/earbuds that fit best his/her lifestyle and daily routine. 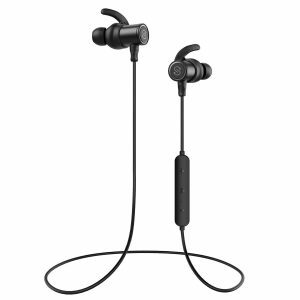 For example, if you spend a lot of time in the gym, you will probably buy the earbuds with IPX6 or IPX7 rating that don’t pop out and that offer nice and comfortable fit. Also, if you travel a lot, you will probably pick the model with the longest battery life, etc. This is why we can’t really specify which headphones are the best but we can list at least some of the preferable features a good pair of headphones should have. The basic headphone purpose is to play music and this is why you can throw them away if they deliver horrible sound. They have to be at least decent and as you can find many decent headphones for a small amount of money (which also proves our list of 10 best Bluetooth headphones under $100), you shouldn’t settle for less than that. Headphones affect our hearing and we don’t want to repeat here what has been explained so many times. We just want to remind you once more that comfort is very important because we are sure you don’t want to experience headaches or pressure in ears and head, especially if you’re wearing headphones for many hours every day. There is no point in using Bluetooth headphones if you have to wear your phone next to you all the time. Bluetooth headphones should be able to preserve stable connection even if the phone is in a bag or a pocket. You should even be able to leave it at least 10m away from you and still be able to listen to music without any cutouts. AptX codec is the thing that enables you to watch movies via the Bluetooth connection without any noticeable delays. This mostly relates to full-size headphones that are often used for watching TV. If you love watching TV and movies, this is the mandatory feature. Noise cancellation/reduction is something that helps you preserve normal and undamaged hearing, especially ANC. In case those headphones are too expensive for you and you often use headphones in crowded and noisy places, make sure your headphones at least have good noise reduction. Some protection is always better than nothing. Battery life is very important because nobody wants to worry all the time if their headphones will shut off or not. If you usually use the headphones for many hours on daily basis, their battery life should be at least 10 -12 hours or even longer. However, a decent pair of headphones should always offer at least 8 hours of playback time. In the end, there is nothing much to say but to recommend our list of 10 best Bluetooth headphones under $100 to you once again and promise you that you won’t be disappointed with our choices.